Getting fed up with the high ticket prices on wedding items? Zero out a few fields in your wedding budget and "borrow" them instead. This is an item everyone wants, until they remember how it's totally useless after the wedding. Building your own structure is awesome if you're handy, but why not borrow one? Try asking your officiant, venue, or your religious institution if they already have some materials you can use. For my wedding, our Rabbi already had the elements for a simple chuppah, so we used that instead of buying or renting an expensive one. If you are getting married outdoors, find a nearby tree. A tree is not only the perfect backdrop and canopy in one, but it's a great symbol for the family you are making. Instead of hiring a DJ, why not make the music a fun activity for your guests in anticipation of your wedding? Make a form on your wedding site asking guests what song they want to move their bodies to on the dance floor. You (or your Best Man or Maid of Honor) can gather up all the answers to form one epic playlist. Have your coordinator hit play at the start of the reception and let the good times roll. Really have your heart set on a live band? If you are friends with musicians, try asking them to play for a portion of your wedding as their gift to you. Of course, they are working, too, so it may not be fair to keep them from enjoying the full night of festivities. Talk to your friends and family musicians to see how they can be a part of your wedding and enjoy it, too. Looked at the florist's quote and cried? Instead of buying their labor, try having the mothers of the family gather flowers from their homes in mismatched vases to use as table dressings. Bored of flowers and want something unique? Borrow framed family photos from all sides of the family and place them as table centerpieces with a few small tealights from the Dollar Store. Borrow old books from your parents' bookshelves. Pick some ones that mean a lot to you to stack as a cute, nerdy centerpiece. Looking for old decor that you don't have to DIY? Try asking your local department store when they will discard their window displays. Anthropologie tends to take theirs down every month. Every couple wants a cool way to leave their reception, but trying to book a Batmobile or a vintage Rolls Royce can mean the difference between being on budget and having to cut down your honeymoon. Ask around! You probably have a relative or friend of a friend with a cool ride (or a connection to one). Leave in something authentic and cool, instead of paying hundreds for a rental that someone else will have to return for you the next day. While it's awesome to have a professional photographer following you all day, it's simply not in the cards for everyone. Lots of couples are saving room in the wedding budget by going the guest-sourced photography route. All your friends and family are eager to snap photos of the big day already, so encourage them to get their Instagrams ready. A great way to include guest photography can be through a game or scavenger hunt for people or details, like with the Ceremony app. Just be clear about when it is okay to ambush the couple for photos. The wedding goes by fast, so the most beautiful part is seeing your wedding through the eyes of all your friends and family just days later. Remember to make a Dropbox or Flickr account for everyone to add their memories. 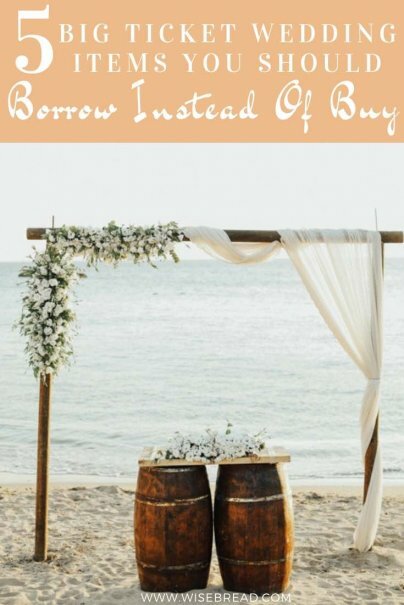 What else should couples borrow for wedding day? Last year I attended a wedding where they used books covered with white paper for center pieces and decor. It turned out beautifully and the bride and groom were both school teachers so it was an awesome idea! They served gourmet choc chip cookies and milk instead of a wedding cake too! Another thing to borrow instead of buy that should have been on this list is a wedding dress and bridesmaid dresses. Years ago I was a bridesmaid at a friend's wedding who had us all rent dresses. At the time I couldn't fathom the idea but now I marvel at how smart she was. Her dress retail was thousands of dollars and she only paid a fraction to wear it for one day. Plus she wasn't burdened by the years of moving and storing a giant dress box. And the bridesmaids weren't stuck with a one-wear dress either. Genius!